Ihor Voronchenko: it wasn't wreck. Ukrainian warships and aircraft that remain in the annexed Crimea was not at all "wreck", as the Russian Federation described it. "As of the moment of the annexation of Crimea, out of eight warships only one landing ship Kostyantyn Olshansky was not in a running condition and needed the repair of main engines. 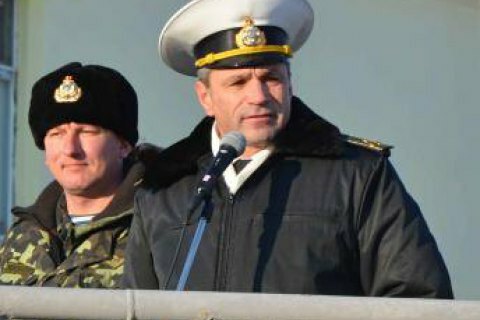 What they say it that was all 'wreck' is not true," the commander of the Ukrainian Navy Ihor Voronchenko said on the TV channel 112-Ukraine on 11 January. Voronchenko said that Ukraine had to leave in Crimea coastal hardware – two battalions of infantry fighting vehicles and the same number of armored personnel carriers of which 15 to 20% needed repair. "Also there were seven fully running artillery divisions and four mortar batteries. The aircraft, which was in a state of exploitation, is now on the territory of Ukraine," he said. The commander stressed that Putin's statement about Ukrainian military hardware should be viewed with caution to avoid becoming a "bargaining chip in the Kremlin game." He also added that the cruiser Ukraina, if brought to combat readiness, would become part of Ukrainian Navy. However, as all of its components are in the hands of Russia, so its re-equipment is an outdated project." Speaking at a Thursday meeting with the editors-in-chief of Russian media in Moscow, Vladimir Putin said that Russia ready to return Ukrainian military ships that are still in Crimea. "We are ready to hand over aviation equipment and armored vehicles. However, it is such a wreck. […] This is the condition it actually was in. And naturally, nobody has ever serviced it all these years," he said.